gruyere är nog den absolut godaste osten jag vet. enormt lyckorus att få stoppa en bit av den i munnen! Jomenvisst, gruyere ar definitivt uppe bland mina favoritostar ocksa. Den funkar ju sa bra smalt ocksa, perfekt i varma mackor etc. The other plan I had for the courgettes was along the lines of cutting them into strips and making some kind of pasta. I'm looking forward to seeing what you get, and what you make out of it. Like the simplicity of it and yet, it sounds so flavoursome! Can just see it, served with some warm ciabatta and a nice glass of wine! Some times you don't need many ingredients to make something that has lots of flavour. This one ticked all the boxes for me. You're on the right track with the ciabatta and wine! 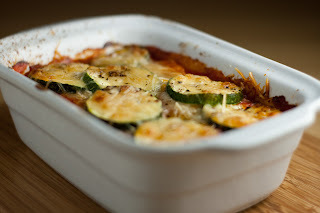 I've just encountered this recipe while searching for things to do with my own Abel & Cole box - my first one comes next week and it's the first time I've orderd a veg box! I've enjoyed reading other recipes of yours now, so thanks.